Looking for a frozen treat for you or the kids these are great all year around. Grapes are a great fruit and good for you! 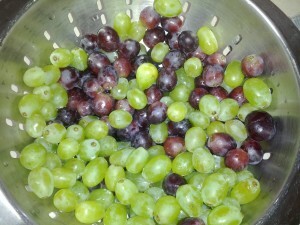 Thoroughly rinse your grapes and pick all of them off the vines and dry them well. After you had dried all the grapes get a freezer safe plastic bowl and put the grapes into the bowl. Within a few hours you have a cold frozen treat for your family! Also, great way to keep your wine in chilled. Just throw a few of them in your glass and enjoy!